There is no substitute for economic growth. Can you guess how many years it has been since Pakistan’s economy grew at a higher rate than India’s? It was all the way back in the year 2000 when India grew at 3.84 percent and Pakistan grew at 4.26 percent. That was nearly two decades ago. How about the last time Pakistan had two consecutive years in which it grew its economy at a higher rate than India? Can you guess how long ago that happened? It was 1991 and 1992. India grew at 1.06 percent and 5.48 percent. Pakistan grew at 5.06 percent and 7.71 percent. That is nearly three decades ago. The disparity in economic growth with India is not new, but it has – to Pakistan’s great detriment – largely been a phenomenon that was neglected by Pakistani economic policy elites. This is not surprising. The youngest members of the economic policy elites in Pakistan today tend to be over the age of sixty. These folks were at least in their early thirties in 1991. It isn’t surprising that India’s dramatic story of economic growth has escaped this generation. Anchoring bias is what happens when the first data points that you are exposed to set the benchmarks for how you perceive all future data points. If you trained as an economist or finance specialist in the 1970s or 1980s, your first exposure to the Indian economy was a derisive term called the ‘Hindu rate of growth’, which Western economists used to employ to sneer at the socialist values that drove India at steady but low rates of economic growth for the first three decades after 1947. Pakistani policy elites suffer from this anchoring bias. Until the 1990s, Pakistanis had a legitimate complacency about their country’s economy. It was a juggernaut throughout the 1960s, it had a quickie romance with socialism in the 1970s, and it had the benefit of a generous endorsement from Ronald Reagan’s America in the 1980s. A thirty or forty-something economist would have entered the 1990s with a decidedly confident view about Pakistan’s future, and at least a hint of derision for India’s backwardness. Fast forward thirty years, and Pakistan is staring down the barrel of the same gun; no matter what hole it peeks into: there just isn’t enough money. Still stuck on the container, and easily lured into speaking from it, the PTI – from the prime minister on down to the finance minister, through the array of in-fighting senior ministers – seems to think that blaming the past is an adequate political strategy for the future. It may well be. In the age of Modi, Brexit and Trump, any fiction with enough trolls to back it can win the day. But there are plenty of serious people in the government too. And they know that the fiscal crisis in Pakistan is a generational issue. The problem of not having enough money has eight separate dimensions. The first of these is compromised sovereignty and autonomy. The need to borrow foreign currency denominated debt comes with strings. Exhibit A? The notion of a free-float currency in which the IMF will “allow” the State Bank a fixed amount to spend on managing the currency. Pakistan is forced to cede its sovereign right to manage its currency because it doesn’t have enough money. The second dimension of not having enough money is the default restriction it places on national security spending. Last year, India entered the world’s top five in security spending at $63.9 billion. Pakistan’s total allocations for its military are less than one-sixth of India’s, at roughly $10 billion. In fact, India’s new weapons programme alone exceeds Pakistan’s entire military budget. This doesn’t just have implications for war-readiness. It also affects how countries treat Pakistan. If Pakistan could afford the military hardware spending spree that India is on, would France be bending over as far back as it is to try to please Ajit Doval at the UN Security Council? The third dimension of not having enough money is the limited ability of the government to help those in greatest need. The prime minister’s compassion for the most vulnerable Pakistanis is being formulated into policy by the indefatigable Dr. Sania Nishtar. Notwithstanding the unfortunate rumors about a potential renaming of BISP, the government’s anti-poverty plans under the Ehsaas banner are laudable. The key challenges, other than administrative vitality will be just how much more can be squeezed out of a programme that many believe has not been able to keep up with the cost of living. Pakistan should be providing twice as much to BISP beneficiaries, and it should expand the net of beneficiaries to twice as many as the current six million. But doing so costs money. Money that the country does not have. The fourth dimension of not having enough money is inadequate and insufficient service delivery. Pakistan cannot provide clean drinking water to nearly 25 million citizens. It cannot offer to school to over 22 million children. Its infant and child mortality rates are among the highest for a country of this size and GDP. Malnutrition causes scandalous levels of stunting and wasting. Among the many causes for such a deplorable state of service delivery is not having enough money. The fifth dimension of not having enough money is that it forces the country to make insufficient investments in infrastructure. Both the State Bank and the World Bank have estimated that Pakistan needs an annual infrastructure investment of between 6 percent and 9 percent of GDP. This equates to a minimum of $18 billion – every single year. This means that for infrastructure building alone, the country needs to collectively allocate over Rs2,500 to the PSDP and provincial ADPs. Pakistan has not approached anything close to this level, ever. The sixth dimension of not having enough money is what heavy domestic borrowing by the government does to investment at home. It crowds out the private sector and makes banks and financial institutions fat and lazy. The seventh dimension is how a fight for money corrodes national cohesion, as is manifest in the building narratives around the National Finance Commission award. Finally, the eight dimensions of not having enough money is that it lends the country’s system to seek quick fixes, which causes a host of fallacious diagnostics about why there isn’t enough money. The current leadership’s obsessions reek of such fallacious diagnostics. 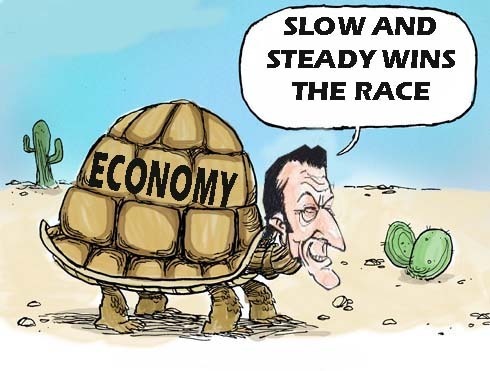 Corruption, external debt and the current account deficit have fuelled the PTI government’s insistence that Pakistan’s problems can be solved by finding stolen money, by avoiding the IMF (hence the seven-month delay in finalizing a programme), and by reducing imports. But not enough money, at the end of the day, is about low economic growth. In an economy that isn’t growing, even high tax rates will not be able to pay for what the government needs. After eight months in power, it is clear that the PTI government will not be able to deliver a major boost in economic growth in the coming fiscal year. But what should worry all PTI supporters, and all Pakistanis at large, is the continued absence of seriousness within the government about the fiscal regime. The least this government can do is to ensure that it plans for adequate measures to extract a fair share from those in this country whose wealth is entirely a product of being from here, of conducting business here, of enjoying the security provided by the armed forces here, and of driving on the streets here. Wealthy Pakistanis need to pay enough into the system to keep the country solvent. For too long, their wealth has been subsidized by an egregiously regressive set of taxation measures that punish the middle class and working class Pakistanis who have to pay GST and withholding taxes on all kinds of basic necessities. There is no substitute for economic growth, but there is a stop-gap: it is a fair and just fiscal regime in which the poor and middle-income groups of the country are punished the least for living in a badly governed country.